Beautiful little 7" sized paperback book reproducing the monochrome photographs of Anna Arnone taken in the early eighties when Anna was frequenting the fervid UK sound system world, just as sounds such as Sir Coxsone, Fatman, Unity and Saxon were poised to take the UK by storm featuring the talents of Smiley Culture, Asher Senator, Peter King and others, including the lady deejays such as Lorna Gee and Bionic Rhona. Many of Anna's photographs were used by the NME, Black Echoes and other hip periodicals of the day. 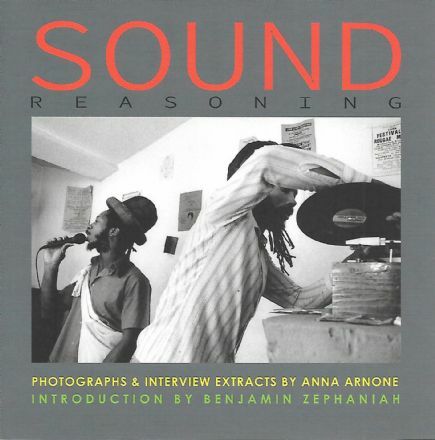 Packed with great photo's as well as interviews with many of the main players in the thing, this book is an essential addition to the reggae bookshelf.